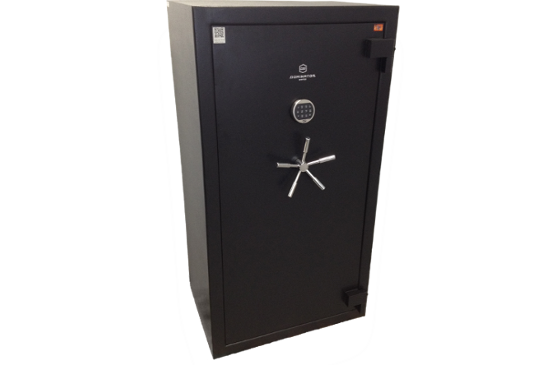 The DS-0 is an exceptional domestic or commercial safe, providing high security and long fire protection in a compact size. 60mm thick walls ensure maximum resistance to forced entry while insulating from intense fire attacks. With the increased height and depth in the DS-1, the volume increases by over 60% compared to the previous size, making the DS-1 exceptional value for high security domestic, or low volume commercial safe applications. The DS-2 is the first size to include the large commercial safe footprint, making it the perfect solution for securing cash register till drawers and large valuables, protecting them from theft and fire. The DS-2 is also the first of the DS Series safes to provide dual internal relocking devices and 3 directional locking bolts for added security. Using the same footprint as the DS-2, the DS-3 provides 97L of secure storage and protection from fire. With 6 locking points around the door, the DS-3 provides exceptional protection against forced entry and intense fire. Standing over 1m tall, the DS-4 is the perfect high volume commercial safe. The tall narrow orientation reduces the amount of floor space required and making it easy to install through narrow doorways. While providing large amounts of internal secure storage, the DS-4 also makes regular access simple and easy. The Huge DS-5 provides extra large volume storage in high security and high fire resistance applications. The 397L internal capacity make it one of the largest certified fire and theft safe in the Australian market. Suitable for secure storage of high value and sensitive items as well as for Pharmaceutical use.